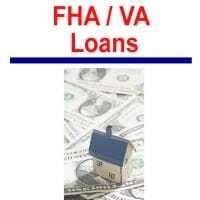 In today’s article we’ll discuss how FHA and VA Loans affect your offer. In most real estate contracts it’s necessary to include the type of financing the buyer will be obtaining and FHA and VA is no exception. In fact it’s actually more important to include the financing on these types of loans because the seller will need to pay for certain items that aren’t required with conventional loans. Those fees are considered non-allowable fees which will cover next. Non-Allowable Fees – FHA and VA loans have certain restrictions which state the buyer cannot pay for some items that are normally paid for by the buyer. Certain fees charged by escrow companies, lenders, title companies, etc are considered non-allowable and not allowed to be paid by the buyer but they are fees that still need to be paid by someone so the seller is the one that will likely pay in the end. Many of the fees that are considered non-allowable are fees charged by the lender. When a buyer goes through the pre-approval process it’s a good idea for the buyer to have a discussion with their lender to discuss what if any fees will be “non-allowable” and how much those fees are going to cost. These non-allowable fees are fees that a seller would not normally have to pay for if the buyer was using conventional financing so the information must be disclosed in the offer from the buyer to the seller. One important thing to remember while making your offer and during your negotiations is that since the seller will be responsible to pay for these non-allowable fees, a seller might not be willing bend on the price and terms as much as they normally would on a conventional deal. Appraisals – Another point to consider is that FHA and VA loan appraisals are a bit more complex than conventional loan appraisals. During an FHA or VA appraisal, the appraiser has to also inspect the property for certain items to make sure it’s up to FHA and VA standards which also incurs a bit more cost on the appraisal. The additional inspection is not a full home inspection but due to the nature of the additional inspection, if there are items that are required to be done on the home and fall under “Lender Required Repairs” then these items that need correction must be cured prior to the home closing escrow and resolution of the items are contingent on the lender approving and lending to the borrower or buyer of the home. You guessed it, these are repairs that a seller would not have to pay for if the buyer was using conventional financing. When writing an offer with FHA or VA financing it might be a good idea to include an amount or verbiage that states a not to exceed amount for the repairs that way the seller can accept your offer with an idea of what might be expected from them to pay when the time comes to complete the lender required repairs. On the other side of the coin whatever amount you put in the contract in advance for repair costs very well might be the amount the seller will not be willing to negotiate on so be mindful of your negotiations. What are some of the repairs that might be called on an FHA or VA appraisal? Note: This list is for reference only, and will generally require analysis on a case by case basis. This is not meant to be an exhaustive list. Check your local municipal building department for local building code requirements, this list is not meant to replace, and may differ from your local building code. Offer Tip: When writing an offer with FHA or VA financing on a home that will likely require lender required repairs to ensure no money is left on the table a buyer might want to use the following verbiage; “If lender required repairs are less than the requested amount, any excess will be credited towards buyers reoccurring and non-reoccurring closing costs and or pre-paids”. Hopefully this article helped you understand more about How FHA and VA Loans Affect Your Offer. If you have any additional questions, please feel free to contact us or leave a comment below.